Regular exercise increases vigor and promotes a general sense or well being. If done in moderation , it can help relieve the effects of stress, and has been linked to decrease in psychological depression. The fun of sports and physical activity is one of the “healthy pleasures,” and greatly improves the quality of life. Regular exercise produces positive physical results like increased muscular strength and endurance, more efficient heart and respiratory functioning, and greater flexibility. However, conditioning has been described a process of pushing the physical limits (tearing down), recovery is often overlooked but is essential for the rebuilding phases, and to realize the benefits of a conditioning program. The “tearing down” phase of the adoption process often involves stiffness and soreness, especially when the movement is significantly increased from what the body has been used to in the past. Delayed muscle soreness (24-48 hours after exercise) may be caused by any of a number of different factors. Some possible causes are minor muscle or connective tissue damage , local muscle spasm that reduce blood flow, or a build of waste products(metabolites) from energy production. 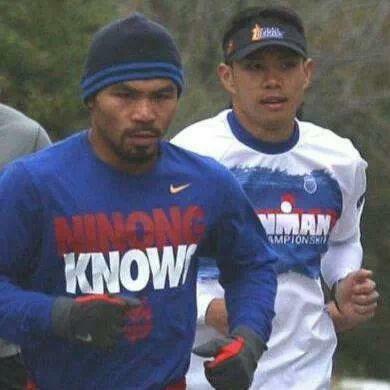 Rolfing from a certified Structural Integration professional has proven itself to be highly beneficial to amatreur and professional athletes around the world, including professional boxer Manny Pacquiao, as pictured above with our client and friend Arland Macasieb, a national triathlon champion and top triathlete in New Jersey. Contact us for more info on how Rolfing can improve your life as an athlete of any status.